One advantage of the vagabond lifestyle I’ve adopted is that I’ve visited numerous national and state parks coast-to-coast. I’m starting a series highlighting the major features of the national parks. In October 2009 I drove from Indiana to Colorado where I visited with family and friends in Colorado Springs and attended the fall workshop of the Rocky Mountain Chapter of the American Society for Indexing in Denver. One of my sisters, Mary Hunt, flew there to meet me, and we began a 10-day road trip that for her ended in Portland, Oregon, because she had to fly back to Indiana. I then drove to Bellevue, Washington, for a house/pet-sitting assignment which provided me with new places to explore…but that’s another post. To view a slideshow of Grand Teton and Yellowstone National Parks, click on any photo. If info about the photos is not displayed in the slideshow, click Show Info. A serious snowstorm challenged the beginning of our road trip, but we persevered. When we encountered a total white-out lasting just a few seconds on I-80 West (after we left Cheyenne, Wyoming), Mary and I both screamed. Thankfully the white-out lasted only a few seconds. Much scarier than any snowstorm or fog I’d previously encountered! Jackson, Wyoming was our home for the few days we spent exploring the highlights of Grand Teton and Yellowstone National Parks. Although I’d attempted to reserve a room at Old Faithful Snow Lodge months in advance, I was unable to book a reservation. Thus we’d reserved a room outside the park. I’d been able to make dinner reservations at the dining room at Snow Lodge, and when we walked into the hotel a sign proclaimed Rooms Available. I guess it would pay to recheck the reservations site closer to the date you’ll be visiting a national park. 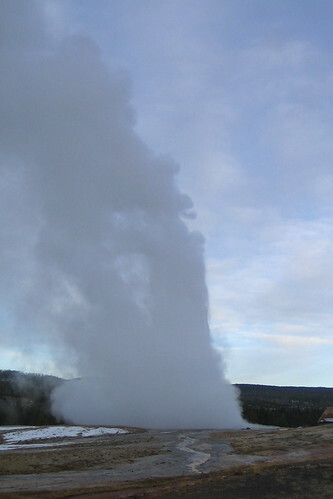 Highlights of our trip: Grand Teton mountains, Old Faithful Geyser, hiking the Geyser Basin, Grand Canyon of Yellowstone. Mule deer, coyotes, and bison were abundant. 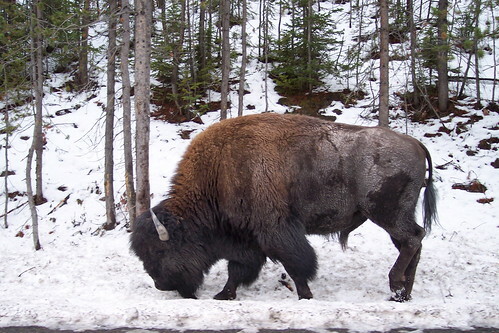 A herd of the bison grazed along one of the roads. Mary had the passenger window rolled down as I drove very slowly through the herd. She was able to photograph one of the bison very up close and personal—no zoom lens required! I learned the hazards of traveling on a tight budget. We lunched in the car daily with fruit acquired at breakfast at our motel, peanut butter and crackers, and iced tea. I placed my small digital camera on the console between the front seats (above the drink holders), and oops! my camera slide into a glass of tea. I immediately took out the SD memory card and battery, soaked up the excess liquid with napkins, and left the camera open the remainder of the day. Next day it was working! However, the view finder was always cloudy. I retired that camera a year later, and it still works well.